The Tampa Bay Buccaneers have long identified themselves as a team that will win in the trenches and players in strewn throughout their history like Warren Sapp, Mike Alstott, and Simeon Rice have exemplified that model. But last season, the offensive line was one of the worst units on the field for the Bucs, allowing 35 sacks and consistently allowing franchise quarterback Jameis Winston to be pressured into poor decisions and turnovers while the running game struggled and eventually accounted for less than 30% of their offensive output; meanwhile, their defensive line was one of the most talented in the league on paper with Gerald McCoy and Robert Ayers leading the team in sacks, but having a bottom-third ranked rush defense. The 2017 version of the Buccaneers has an improved offensive line, with center Ali Marpet putting down his ukelele and continuing his excellent 2016 play anchoring the center of the Tampa Bay line; his transformation from one of the better guards in the league into one of the best centers has been fun to watch and he will present an issue for Kawann Short and Star Lotulelei up the middle.  J.R. Sweezy, who spent most of 2016 on the shelf, is an excellent run blocker and is hard to break free from when once he gets his hands on you; Kyle Love and Lotulelei will have to beat Sweezy one-on-one for the Panthers to stuff runs up the middle as they’ve been able to do most weeks this season. Much like the Week 5 opponent Detroit Lions, the Bucs rotate their left guard between Evan Smith and Kevin Pamphile, and much like in the Lions game, this should be a matchup that Kawann Short can dominate. 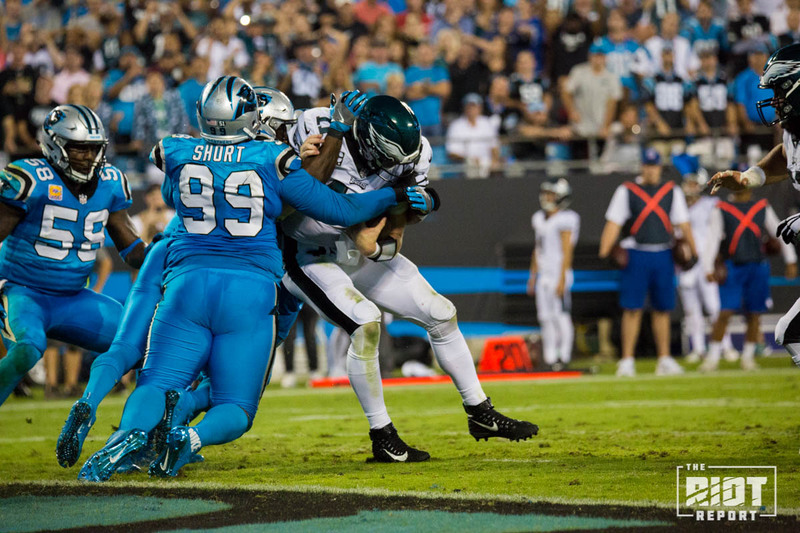 Short has quietly been having another excellent season in the middle with four sacks, a forced fumble and recovery and a field goal block less than halfway through the year, and he should be able to draw Marpet’s help, leaving one-on-one rushers on the edges. The Bucs’ have only allowed 32 pressures on 167 passing plays this season, and Demar Dotson has been a huge part of that. The nine-year veteran has been excellent on the outside, and his matchup with Julius Peppers will be one to watch as they battle for position on both passing and rushing downs. Left tackle Donovan Smith can sometimes struggle with faster defensive ends, and Mario Addison will give him fits throughout the day. The Panthers defensive line is one of the best in the league and matches up favorably with a stout unit in Tampa Bay. Not such a favorable matchup? A banged-up and struggling Panthers offensive line missing their leader Ryan Kalil for the sixth game this season having to deal with one of the most talented defensive lines in the league. While Tampa Bay may have just placed Noah Spence on injured reserve, defensive tackles Gerald McCoy and Chris Baker still will present a huge challenge for the interior linemen that were expected to be among the strengths of the team. While the Buccaneers have not had a ton of success in their pass rush this year with only seven sacks in six games, perhaps due to an ineffective Mike Smith scheme that has multiple twists and stunts on the defensive front. McCoy and Baker are hugely successful when they are able to go one-on-one with guards or centers and if they are given the opportunity to do this against backup Tyler Larsen, who has had trouble with speed rushes and quick moves, or Turner, who was blown up the past two weeks by powerful rushers Fletcher Cox and Akiem Hicks, they may be more successful with putting pressure on Cam Newton, who was sacked five times last week in Chicago. The Panthers run game has been downright anemic, with both Jonathan Stewart and Christian McCaffrey unable to find lanes to run in even when the Panthers have jumbo packages in the game. 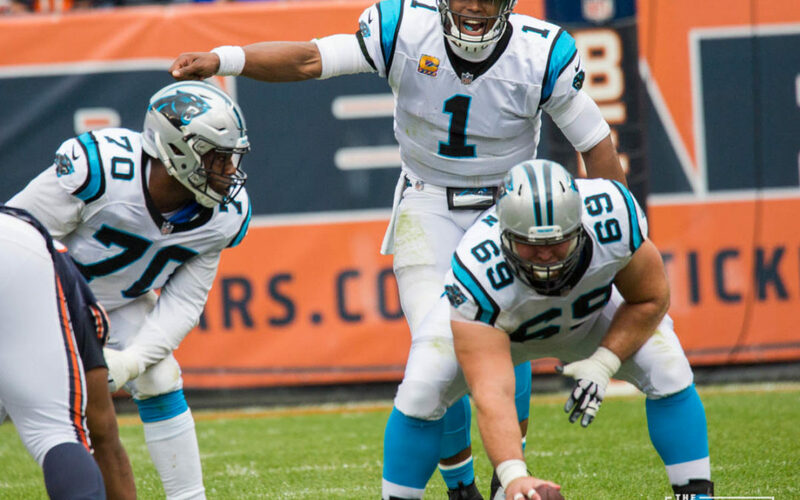 If the Panthers are to be successful running the ball, tackle Matt Kalil must be able to pull across the line more effectively than he did last week in Chicago, Kalil and fellow tackle Daryl Williams also must be able to protect and set the edge, especially if the Bucs are going to run the 3-3-5 scheme they’ve been running the past few weeks. This takes a lot of the natural talents the Bucs linemen have up front and utilizes them as space eaters and run stuffers instead of pass rushers as they’ve been in the past. The 3-3-5 alignment can be similar to the 3-4 the Panthers faced last week and had issues with when multiple blitzers come, but it has been largely ineffective in Tampa Bay. It will be interesting to see if the Buccaneers continue to utilize it, especially when it has led to such low sack and quarterback pressure numbers.